When we moved from the inner suburbs of a big city to ten acres in the country one of the big changes was our neighbors. 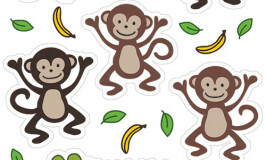 We no longer live so close to our neighbors that we can hear them fart in the shower (true story!). We now have horses for neighbors on one side, and the nosiest neighbors we have are the cows in the paddock out the back who dance and sing to the full moon (also a true story). We do have some people neighbors though, and they are just lovely. They fed me sausage sangers when I was in early labour with my middle child, and now they take him for rides on their little quad bike. They are always dropping in with little gifts for our kids, despite the fact that they have grand kids of their own to shower with gifts. They gave our kids chocolate bunnies for Easter and they gave us adults a bottle of their amazing homegrown lemon olive oil, yum! 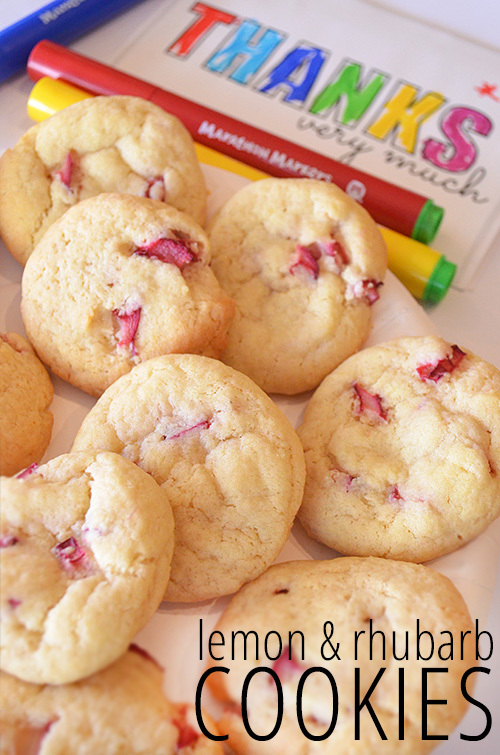 So on the weekend we decided it was time we dropped in with a little gift for them… Lemon and Rhubarb Cookies. These cookies are soft and buttery and oh so lemony, and while they are fancy enough to give as a gift, the kids love them too, plus they are easy to make! Chop the rhubarb into small pieces and place into a small bowl. Add the extra 1/2 table spoon of sugar, the lemon zest (use more or less depending on how lemony you like your cookies), and lemon juice to the chopped rhubarb, mix well and allow to sit for a little while. Cream butter and sugars, then add the egg and mix well. Fold in flour and corn flour and then stir through rhubarb mixture. Place table spoons (or bigger!) of dough on well greased trays and cook for 10-15 minutes. These cookies will not brown, they stay very blonde. When you see them starting to go slightly brown around the edges, take them out, or they will be crumbly not soft and chewy. 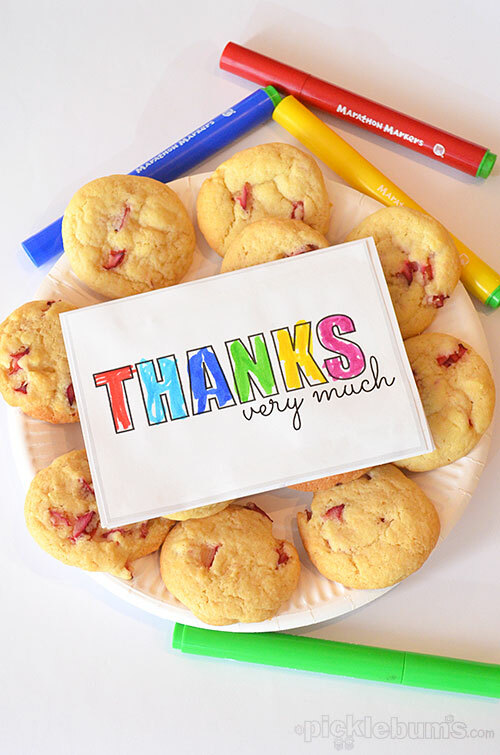 I often print out the word ‘thank you’ for my kids to colour in when we need a quick thank you card, which is exactly what I did on the weekend to go with the cookies, and today I turned it into a free printable, in case you need a quick thank you card too. You can download the free printable colour in thank you card here. These easy cinnamon cookies would also make a great thank you cookie, or how about these fruity oatmeal cookies! What is your favourite ‘thank you cookie’? I made these but the recipe said to turn the oven at 180 degrees, was this right? Mine were runny and not browning, I turned it up to 300 degrees and they seemed to work out better. I noticed someone else called this a bisquit instead of a cookie, is it possible you are in another part of the world? I’m in Nebraska. Yes, this recipe is written with Australian measurements so you will need to convert the oven temp from Celcius to Farenheit. that looks awesome. Just bought a tonne of lemons at the farmers market and have rhubarb in the backyard, I should totally try these! This seems to be a British recipe so you’ll need to transpose C>F. The oven temp should be about 350. I wanted to try these but wasn’t sure about the “corn flour” translation. Some say that it would translate to “corn starch”. In cookies? Really? Is this true? yes corn flour is the same as corn starch, it will make your cookies slightly chewier rather than crumbly. Oh! I wouldn’t have thought that! Thanks for the reply! Im very excited to try this one, my dad grew up in Illinois so for his bday and fathers day every year i make pies with rhubarb. I love cookies can’t wait. thanks for the great recipe!!!! “corn flour”—–is that what I call cornmeal???? Does this recipe use salted butter or unsalted butter? I would usually use unsalted in baking, but I don’t see salt anywhere else in the recipe. They look delicious! If you like a touch of salt in your recipe feel free to use salted, or add some. I don’t add extra salt to many recipes, but I do use salted butter. I made four batches of these cookies in two days. My family loved them! We have a huge rhubarb patch and every year a bunch goes to waste because you can only eat so much crisp and pie. 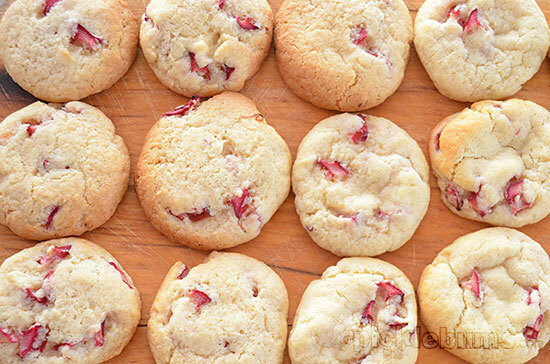 These cookies are great way to change up rhubarb. Thanks so much for the recipe! For people in US – USE CORN STARCH, NOT CORN FLOUR. In the UK these two things are the same thing but in the US they are different. Trust me we made this recipe using corn flour and not corn starch and these cookies came out extremely flat and falling apart because we did not have the starch thickener added. We will be trying this recipe again as the cookies tasted great but were just flat. OK we followed this recipe to a T and they came out even runnier than last time, they literally pooled out into the whole pan. Now I have t try to salvage them as “bars”. I’m sorry it didn’t work out for you, hope you were able to salvage something. Made them today was really yummy. Thanks for the recipe, it works? I made these today I can’t say how they tasted, but mom loves them. She is the taste tester! These turned out amazing. I added a little coconut to the last batch and loved it. Thank you!!! I’m sorry they didn’t work out for you. I am not a master baker so I have no idea why they would get mush as they cooled, perhaps something to do with the rhubarb? Can you use frozen rhubarb? How would you do it – cook it, drain it, blend it? I am not familiar with frozen rhubarb. Does it come already cooked then frozen? 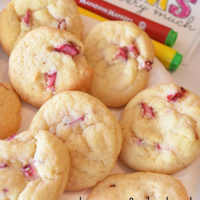 You need to use un cooked rhubarb cut into small pieces for this recipe, it needs to be firm to retain it’s texture and shape when you cook the cookies. If the frozen rhubarb defrosts into firm chunks of raw rhubarb you could give it a try.